Designed to maximize natural light with walls of windows and possibly skylights or glass ceilings, sunrooms are on the border of your home’s indoor and outdoor spaces. With spring approaching, you might find yourself spending more time in your sunroom as the weather improves and flowers begin to bloom. If your sunroom design is looking dated or just needs a bit of a refresh, new window treatments could be just the ticket. Sunroom shades can add style as well as make your room more functional. You may want to reduce the amount of sunlight coming in at certain times of the day, or perhaps you’d like to protect your furniture and yourself from damaging UV rays. If you ever use your sunroom as a workspace, glare reduction might also be important. In order to preserve your views and keep your sunroom filled with sunshine, solar shades are a terrific choice. Available in 4 levels of transparency, you can choose how much light is allowed to filter through the shade. The 1% transparency is the most opaque and features the tightest weave, blocking 99% of UV rays, while 10% is the most transparent, blocking 90% of UV rays. The 10% material in color White is shown in the photo above. When you want to take full advantage of your view, solar shades roll up into a small and unobtrusive roll at the top of your window, unlike other shade designs that fold into layers when raised. They can be mounted within your window frame in an inside mount, or placed on the wall for a taller appearance in an outside mount. If you’re covering glass sliding doors, try outside mounted solar shades so they won’t obstruct your doorway when raised. When lowered, solar shades reduce glare and absorb heat, which may help make your sunroom more comfortable during very hot times of the year. In addition, many of our solar shade materials are GREENGUARD® and Microban® certified, which means they help preserve indoor air quality and they have antimicrobial protection built into the fibers. Browse our Solar Shades Pinterest board to see more materials and prints in action, or customize a solar shade on our website. 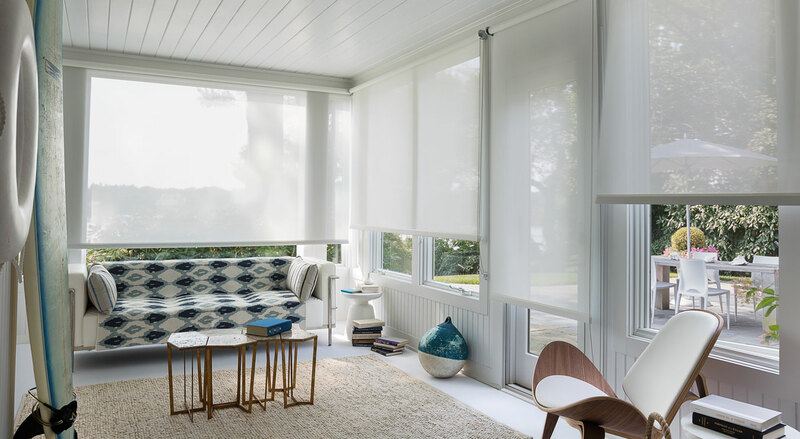 If you have any questions about solar shades for your sunroom or for any room in your home, please give us a call at 800.754.1455 or talk to a design consultant in one of our nationwide showrooms.